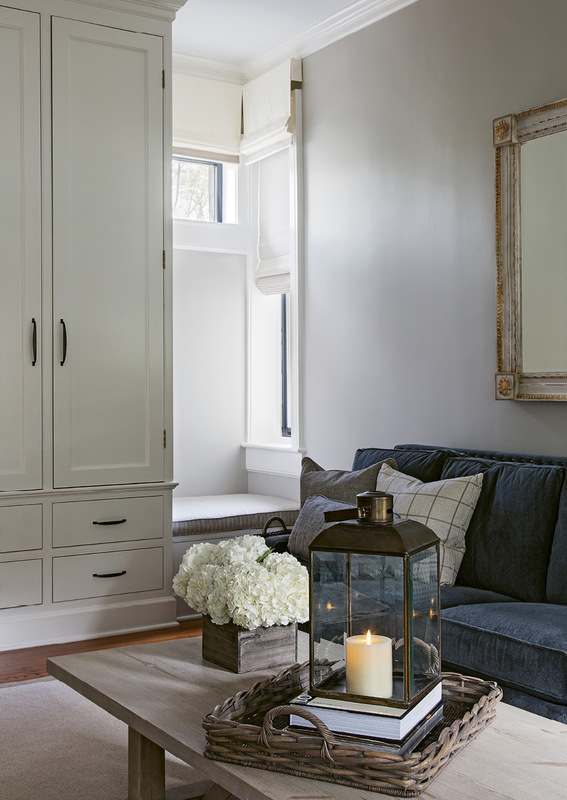 Pattern Play: Armed with a navy and neutral color palette and intriguing fabrics and tiles, interior designer Kristin Peake transformed a drab 19th-century dependency into a light-filled stunner. Go with the Flow: Maryland-based couple Rick and Kristy Schultz “bought a garage”—i.e. 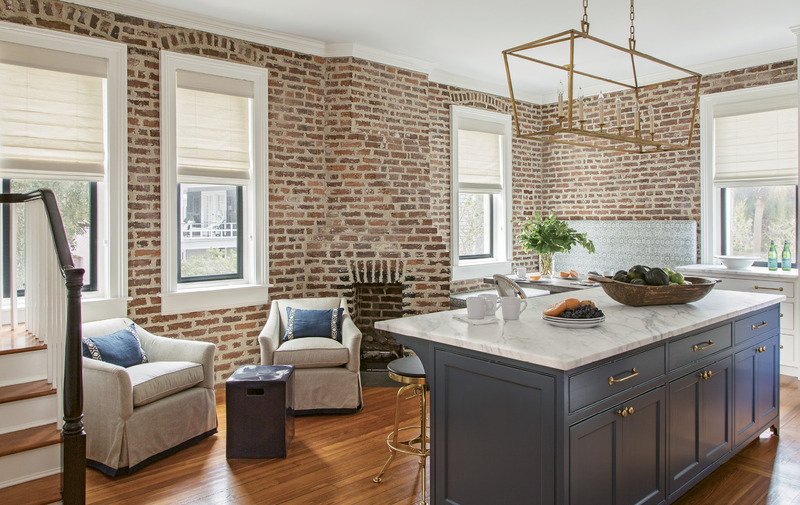 a three-story carriage house in sight of the Battery—as a second home, enlisting Richard Marks Restorations and Kristin Peake Interiors to transform the formerly drab dependency. Just as renovations were wrapping up, Tropical Storm Irma washed a foot and a half of surge into the ground floor (left), which spurred on storm adaptations. 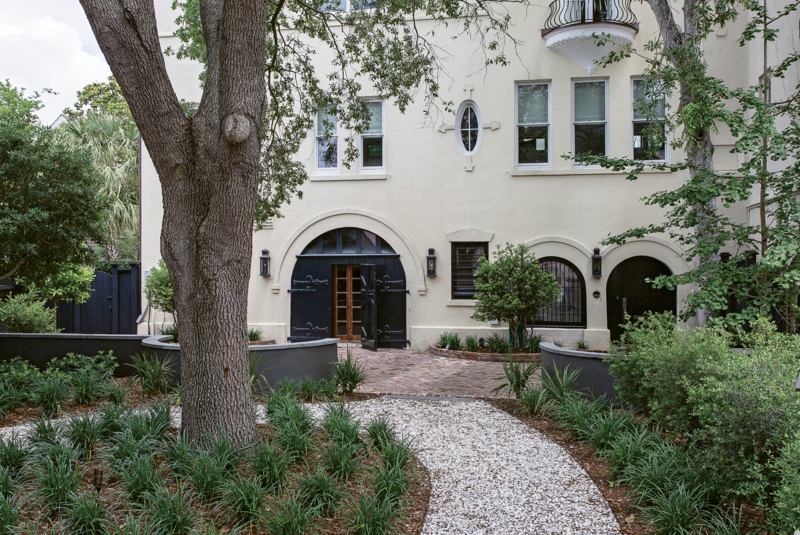 They revised the exterior hardscape with an eye toward drainage and changed up interior materials, furnishings, and electrical wiring to suit. Rick and Kristy Schultz, pictured with their daughter Chandler. Arches and circles dominate the ground floor of the structure thanks to curved doorways for carriages and the stables, plus demi-lunette windows. Walk This Way: The steps leading to the second floor are original to the circa-1856 house; a third story was added in the earlier part of the 20th century. Peake painted the stairwell walls white and hung a convex mirror on the first landing to amplify the light. 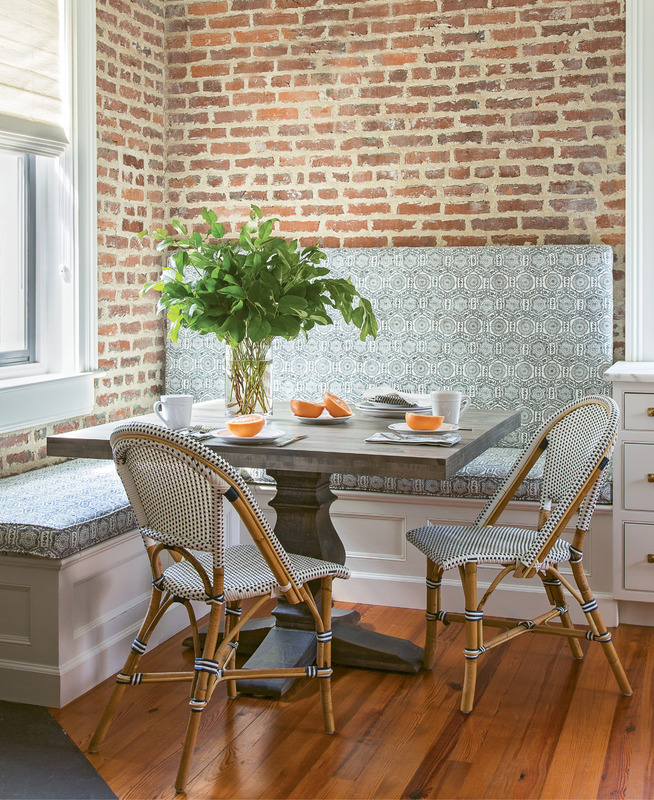 In the second-floor kitchen, Peake played off the navy blue of the island with complementary patterns in the tile backsplash and the washed linen fabric for the banquette. 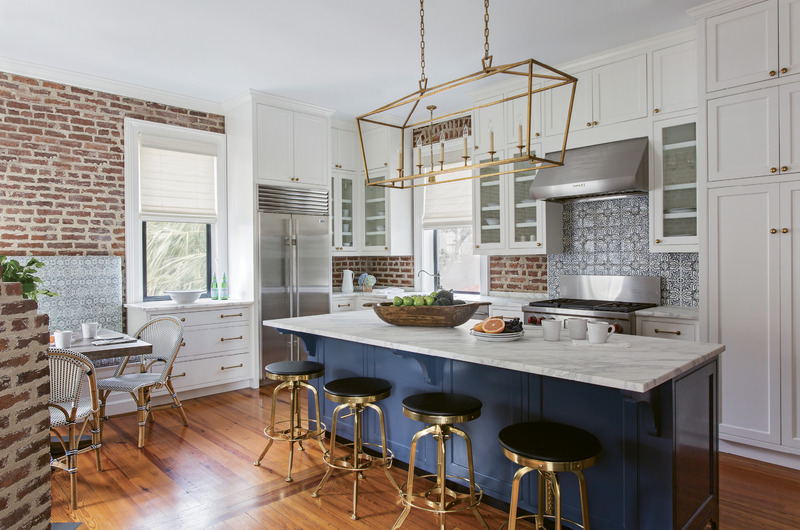 Brass repeated in the cabinet hardware, barstools, and large E.F. Chapman lantern chandelier from Circa Lighting ties it all together. Optical Illusion: As the powder room lacked the depth for a vanity, Peake floated the sink on a mirrored wall, giving the petite space some wow factor. Rick’s only request for the décor? “He said he wanted a really comfortable couch,” says Kristy. The custom sectional from Vanguard offers plenty of seating in the family room. 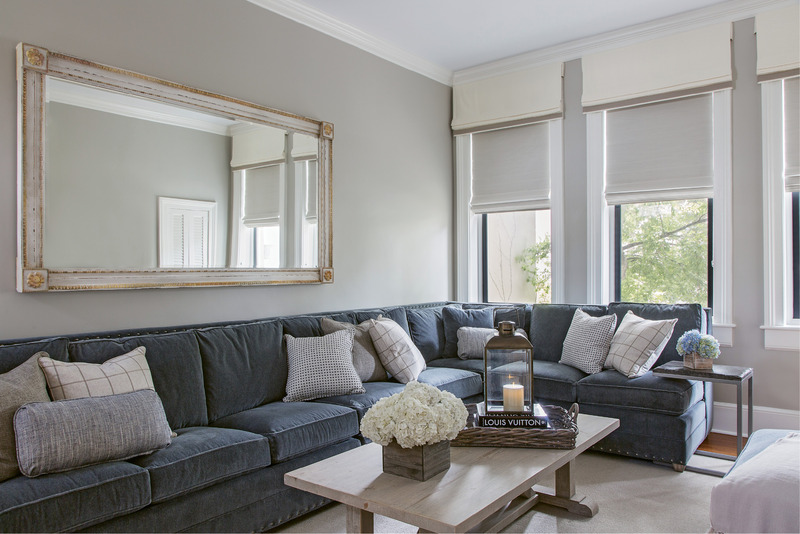 Instead of elaborate window treatments that could easily overtake the decor, Peake chose light-hued, space-saving woven shades and had the window mullions painted in “Kendall Charcoal” by Benjamin Moore for a modern look that highlights the woodwork while creating depth. 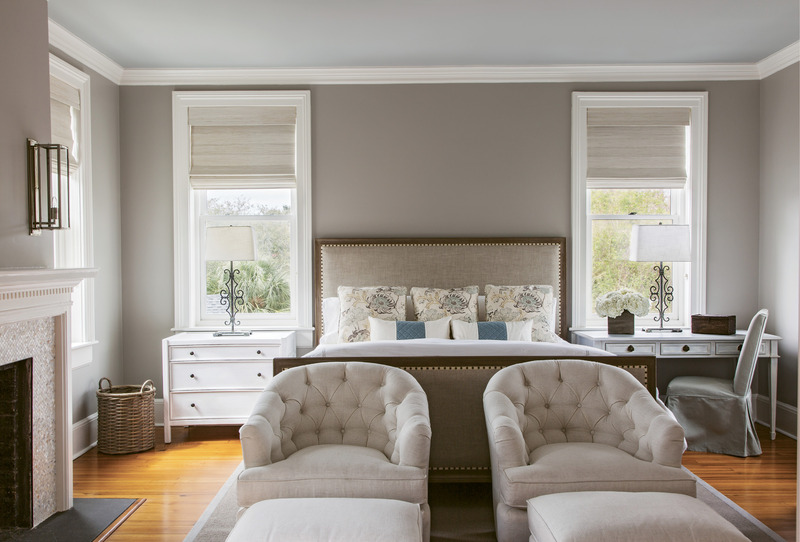 Neutral Territory: For the master bedroom, Peake worked with a neutral palette conducive to relaxation: Benjamin Moore “Cumulus Cloud” covers the walls, with “Half Moon Crest” on the ceiling. The custom headboard was upholstered in Belgian linen. Natural woven shades provide privacy while still allowing for natural light. 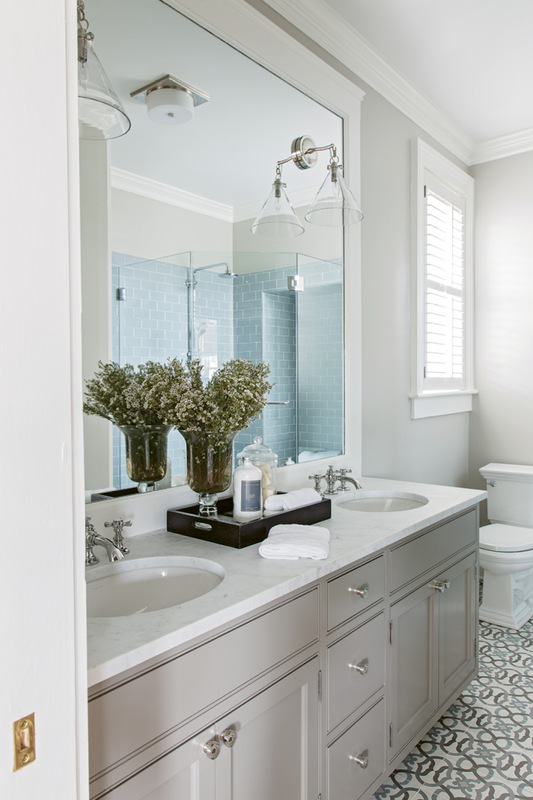 Floored: “I loved the simplicity of the pattern,” says Peake of the cement tiles that set the tone for the master bath. Tiling the bathrooms was the only instance where the original floors were altered. 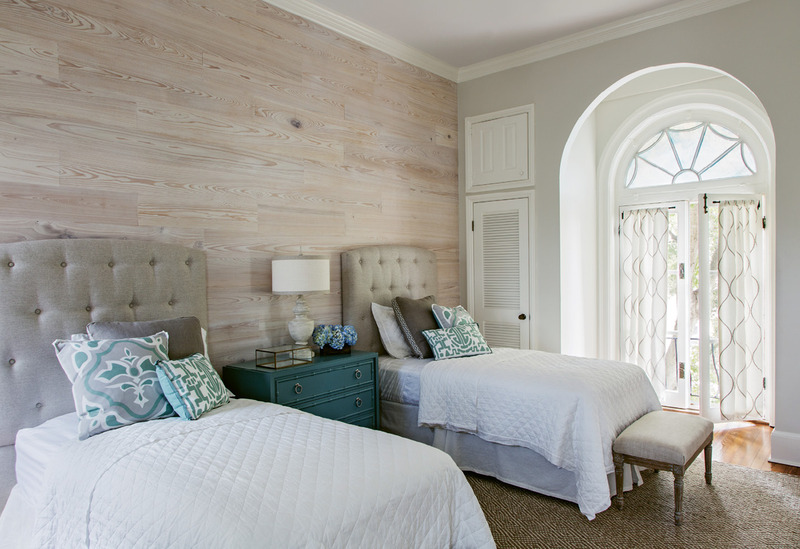 The guest bedroom features an accent wall of whitewashed cypress. 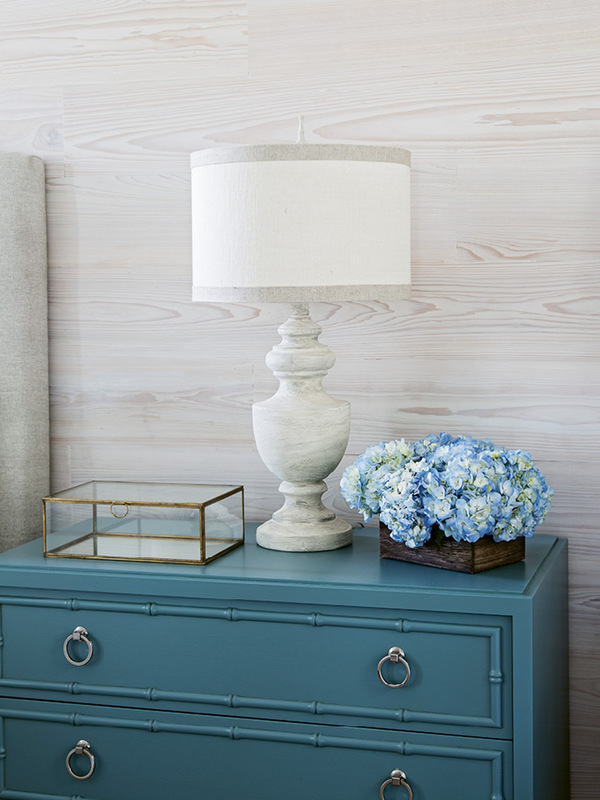 Staying true to the blue and neutral color scheme throughout the home declutters the space overall. Kristy and Rick Schultz know about coming full-circle. The Potomac, Maryland, couple have been married nearly three decades, and, he says, it was during a trip to Beaufort, South Carolina, early in their courtship that sparks between the two ignited something long-term. Now, that little fishing village to our south might not be Charleston proper, but it’s close enough to count for Bronx-born Rick, a fast-talking, genial wealth-management whiz, who, along with his wife, bought a “swanky garage” South of Broad two falls ago and made the Holy City their second home. Of course, there was a little more to it. The Schultzes, who aim to spend half the year here and half in Maryland, are soon to be empty nesters. 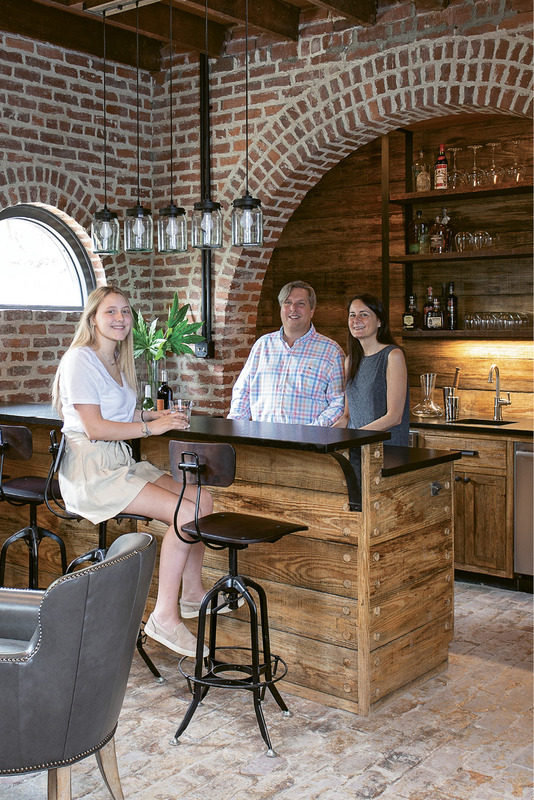 All three of their children attend Southern schools, and Rick’s clientele tends to migrate out of the DC area—in fact, he has more than a dozen Capital City clients who own Lowcountry homes. 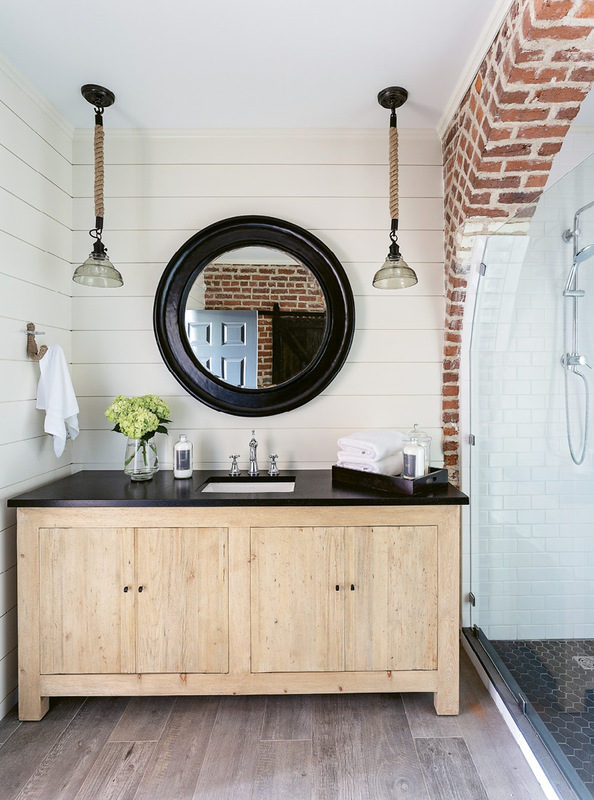 So as the puzzle pieces came together for their work-life balance, they assembled a trifecta of talents: Wertz; Richard “Moby” Marks of Richard Marks Restorations; and Kristin Peake of Kristin Peake Interiors, with whom the couple had worked on the nearly four-year renovation of their Potomac home. They needed the visionaries, they say. “We put in the bid, won the bid, flew down, looked at it, and were like, “Ugh…,’” recalls Rick. Why the groan? 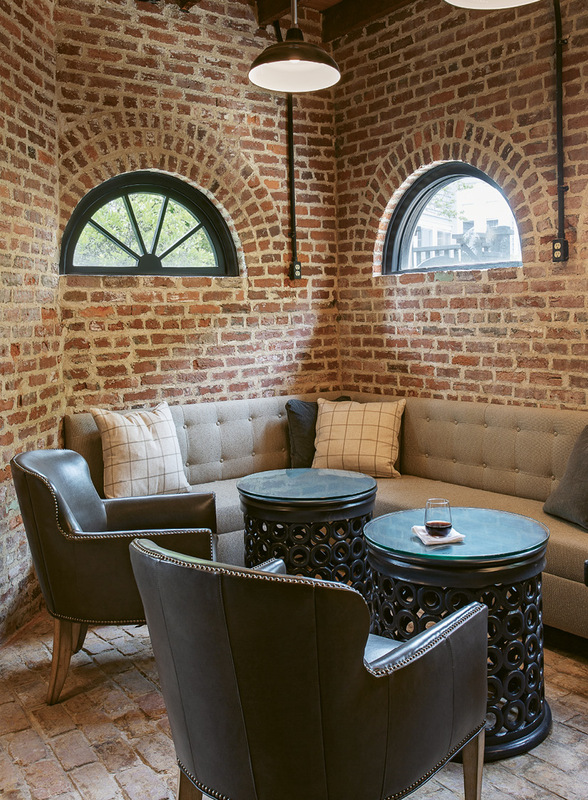 Built in 1856, the structure was originally a carriage and horse stable with slave quarters above. Sometime between 1929 and 1944, the third floor was added, along with tacked-on bathrooms. While arched doors and windows abounded, it was essentially a 3,000-square-foot utilitarian add-on to the main house. Light and airy it wasn’t. And as a historical property, myriad elements (as in, everything on the exterior) were untouchable as far as renovations were concerned. But location, location, location won out. Peake started with the same “comfortable, cozy, sophisticated look” she brought to their Potomac house. 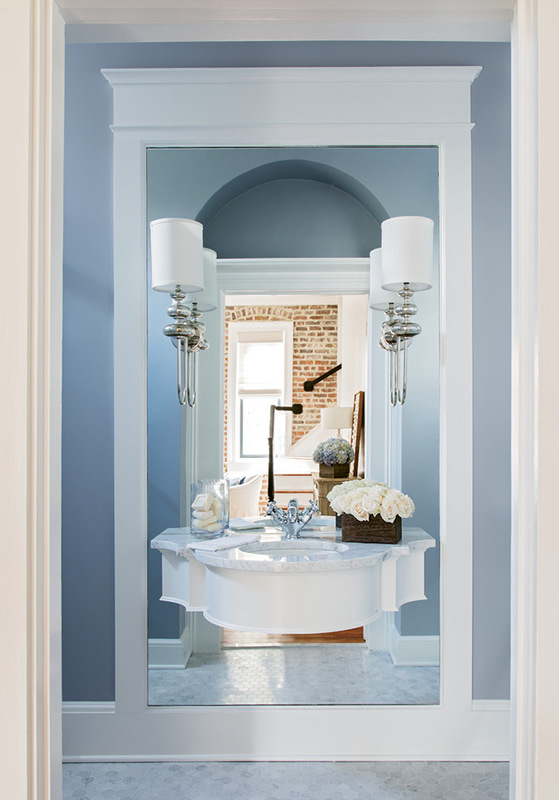 “The Schultzes wanted a similar feeling, but in Charleston they were willing to be more daring,” she explains, “painting the kitchen island navy, adding fun tiles, and doing other things that just didn’t work in their Maryland home.” Peake also sought to infuse the house with as much sunlight as possible. 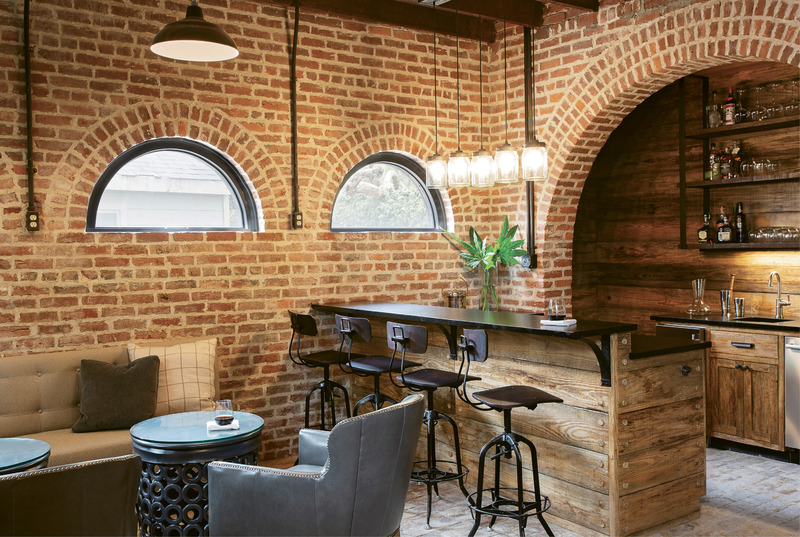 “The Schultzes wanted to maintain any natural light flooding into the rooms,” says Peake. 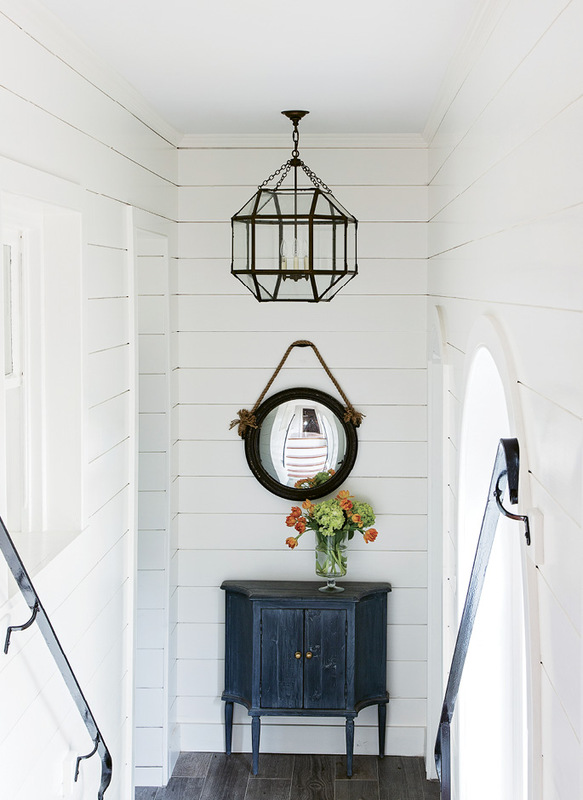 “So I chose natural woven shades rather than window treatments most everywhere.” Last, she grounded the palette in navy, neutrals, and white, she notes, to impart a classic, timeless style—one that makes sense in a dwelling mere steps from Charleston Harbor. Just as the home was on the verge of being move-in ready, Tropical Storm Irma moved in with the worst tidal surge seen in the Lowcountry since 1989’s devastating Hurricane Hugo. “We were almost done when we saw a news report from our home in Maryland warning about the storm,” says Rick. About six hours later, the couple caught another video of people standing hip-deep and holding onto the East Battery street sign. “We knew there was no way not to have water in there.” Sure enough, a little over a foot and a half of storm surge stood on the ground floor of their nearly completed home.